Ambling leisurely down the main drag of the Catalonian village nestled in the foothills of the Montserrat mountain range that we call home for the next week, we realized we were warm. Actually warm. This being our first day in Spain after a few months holed up in Berlin, enduring its notoriously gray winter months, this sensation was something of a revelation. Paul and I had walked out the door of our residence down the hill in the late morning, naturally preparing for the elements as we were accustomed to doing each day: by piling on as many sweaters as would fit under a long green wool jacket (in my case) or a short black polar fleece with Gore-tex overcoat (in his). The wrapping of scarves, pulling on of two pairs of gloves and final addition of sensible hats made us models of outdoor-preparedness in Germany. And in the late morning in this particular valley of a mountainous region, I can’t say I was unhappy with our sartorial decisions. We had, however neglected to take into account a key factor that exists in Spain that does not in Berlin: sunshine. More specifically, the strength of the sun. The strength of the sun when one is situated directly below it and on a mountainside. Elated at the sensation of heat via actual rays of sun, we simultaneously, without speaking, peeled off our hats and gloves, unbuttoned our coats and wished that, without daring to utter the words, we had sunglasses. The village itself is small. 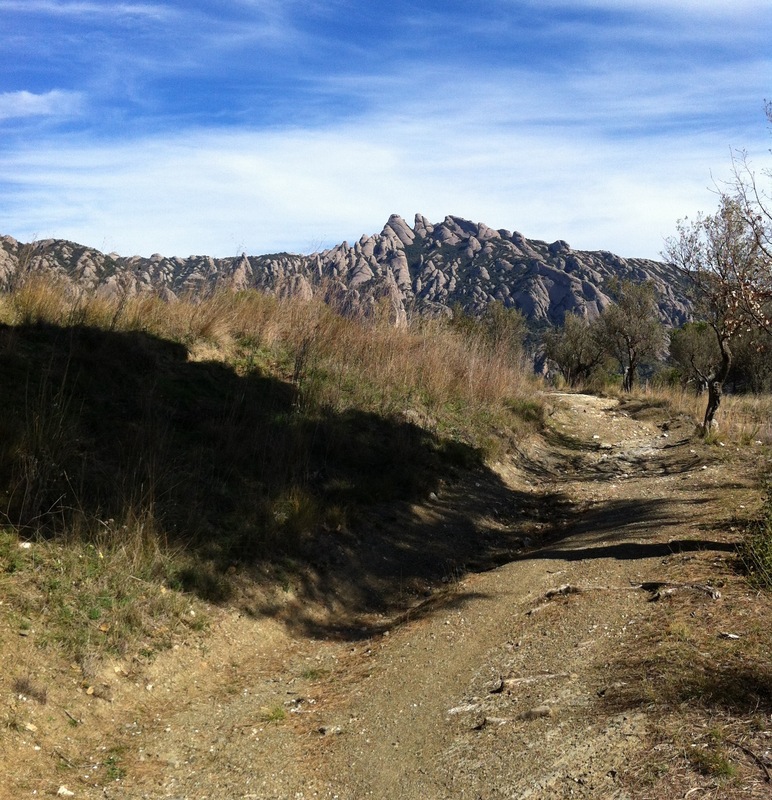 Not many people appear on the streets on a weekday morning, though I imagine this changes in high season or on weekends when hikers and tourists en route to the Montserrat monastery seep into the area. Only a handful of stores, mostly practical, dot the calle principal. A tiny grocery store, a pharmacy, bookshop, simple restaurant and two or three convenience stores could barely provide a half hour of ‘shopping’. But we, happy to be in a new surrounding, browsed the tiny shelves of every convenience store with care, mostly in search of ‘jamón serrano’, but also for anything novel that we might be able to feast on, literally or visually. About halfway through the walk downhill we peered into an empty, cave-like storefront. There were no doors to speak of, just a darkened interior, seemingly cut into the stone, the left side of which was lined with large stainless steel drums, each with spigots on the bottom. More enticing than the visuals of the space was the smell emanating from somewhere even deeper within the cavern: something dank and musty, sweet and bacterial, one that can be deemed neither a stench nor an aroma. These are the most enticing of all olfactory sensations that humans experience: those by which we are simultaneously repulsed and attracted. Like with a good, ripe camembert, we are a little horrified at how it smells, but unable to turn away, in fact, just the opposite: we want it in the ultimate way the nose’s desires can be satisfied. We want to ingest it. By the smell of this particular cave, it was obvious wine production was in process, but probably of a rather low quality, of dubious sanitary standards, or both. Now that 2013 has faded away and with it all the requisite year-in-reviews for restaurants (here, here and here) and pop music (here), 2014 has taken the stage with lists of its own: Oscar-hopeful releases and politico-cultural predictions by just about anyone who thinks you’ll listen. I myself will not make any recaps or predictions other than a libationary one: if 2013 was the year of the Manhattan (cocktail), then let 2014 be the year of the Big Apple. The Big Apple is a little something I invented for the dark days of winter. It has the whisky and angostura punch of a Manhattan, but with an additional soothing element of hot-spiced apple juice. I do like a good Hot Toddy in the cold months, but sometimes I find it lackluster without loads of honey or sweetener. The Big Apple, on the other hand, won’t disappoint with its full and spicy flavors that match perfectly to bourbon whiskey. -Simmer this mixture in a saucepan or pot over very low heat for at least 20 minutes, longer if you like, for a spicier flavor. 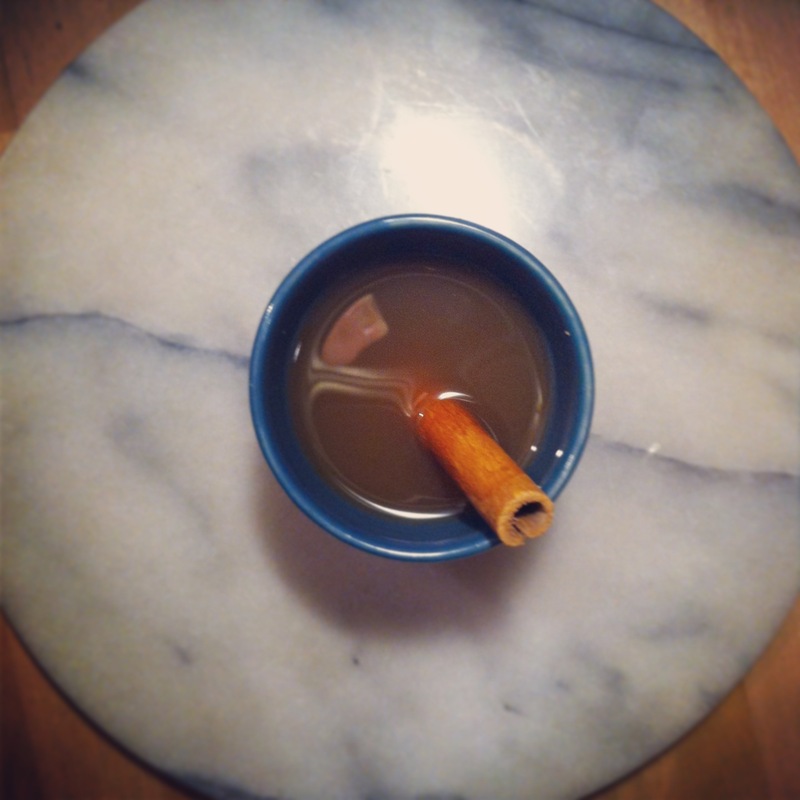 -Ladle some hot spiced apple juice into a small mug. Pour in the whisky and dash of Angostura bitters. 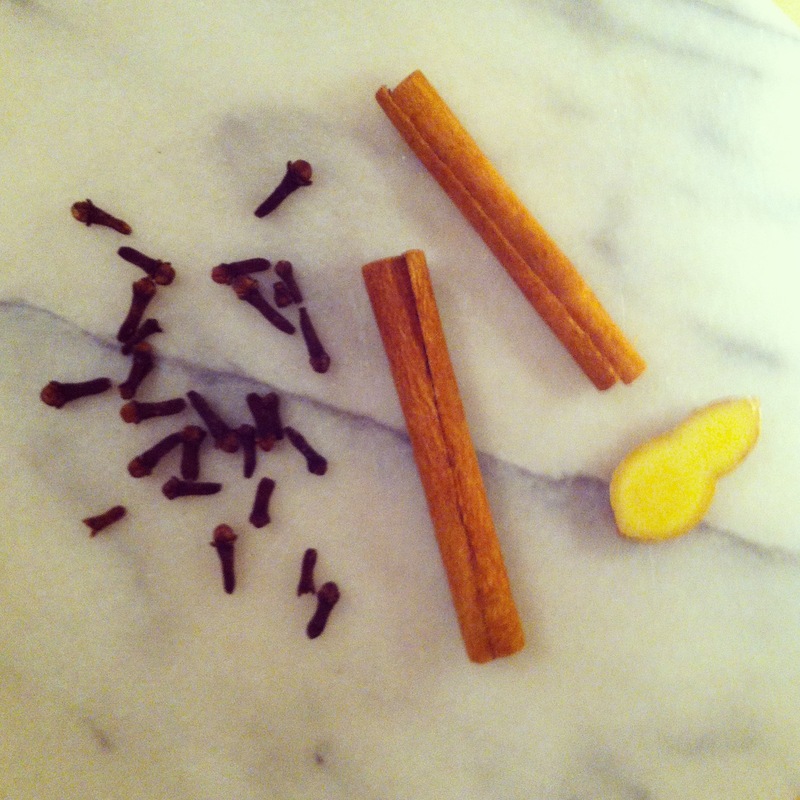 Stir and serve with a cinnamon stick as garnish. *If you are in the US, I would highly suggest using apple cider for this drink. In most countries in Europe, though, if you say apple cider, it means the alcoholic kind. The closest we have to what you want in Germany would be naturtrüber Apfelsaft, basically an unfiltered apple juice. Using this just adds to the overall spiciness and depth of the drink. For the past couple of months I have been lamenting the lack of Fall Things here in Germany. Why aren’t people running off to the countryside to pick apples every weekend? Why are the pumpkins only for eating and not for carving? And don’t even get me started on Halloween… I know. These are all American Fall Things. But wonderful things. Things that should be emulated in all countries lucky enough to have seasons. Traditions, however, are subtle things and even though nothing can ever replace a good apple pie in October, there might –just might– be some German Autumn traditions worth writing home about. Take Zwiebelkuchen and Federweisser, for instance. This culinary tradition, though admittedly more popular in wine-producing regions of Germany than in Berlin, is based upon the seasonal early grape harvest. 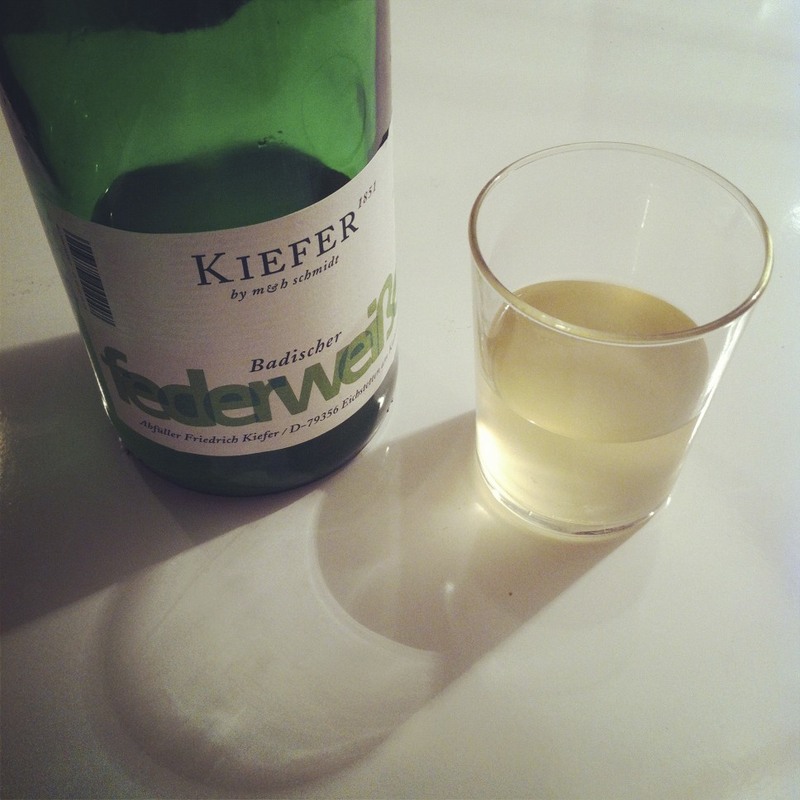 Though it is bottled to look like wine, Federweisser is actually must, the result of partially fermented white grape juice. The taste is somewhere between sparkling white wine and sweet, refreshing grape juice. In order to be Federweisser, it must contain 4% alcohol by volume, but depending on how long it’s been sitting around, it can reach up to 10% alcohol. 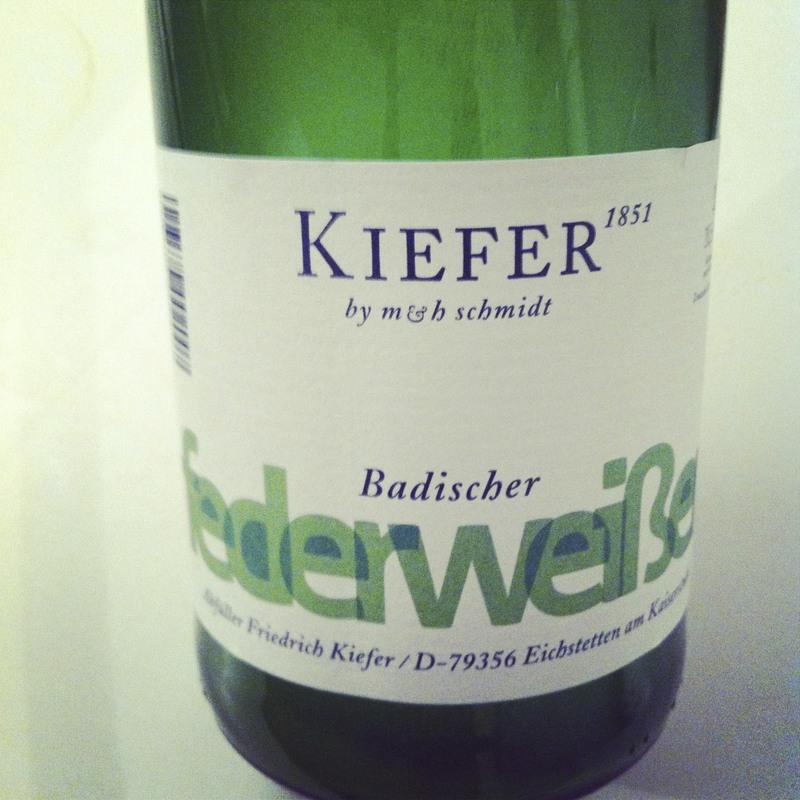 Which is also the fun of Federweisser: you simply never know exactly how tipsy one glass (or bottle…) will get you. In fact I’m drinking it as I write, so if my grammar is a bit off the mark, you know I’ve been blessed with a 10%-er. In fact, though, I have been fortunate simply to have found Federweisser this late in the season, according to my local wine shop, as it is typically available only from early September to late October. 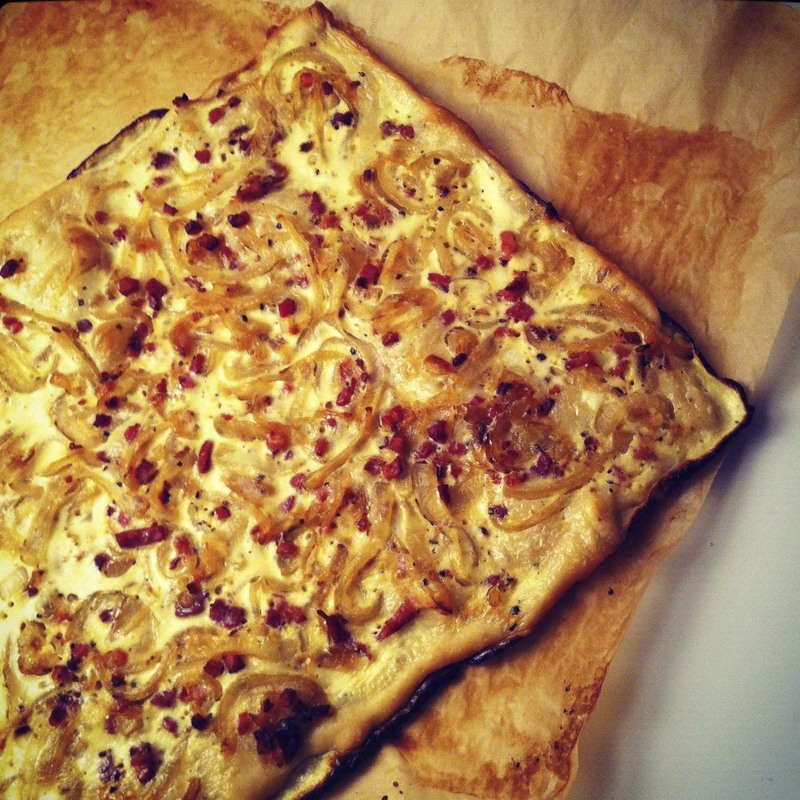 I first had the delicately balanced meal of Federweisser and Zwiebelkuchen (a savory onion tart) at my friend Eva’s house somewhere around mid-September. She, as an excellent cook of all things German and traditional, inspired me that night; I vowed to try to make the dish myself as soon as possible. Now, nearly two months later, after having bought every possible mini-sized candy from the supermarket in preparation for the costumed children who would never even come close to knocking on my door on Halloween, in a near fit of American Autumn Nostalgia, I needed to do reconcile this. I gave myself a pep-talk: German traditions can be good, too. Just try it. So, I tried it. I already knew from Eva’s that it would be a nice meal. With cooler weather, you crave fatty, heavier foods, naturally. Add a couple of glasses of a beverage of ambiguous alcohol content and you really crave fatty, heavier foods. Zwiebelkuchen, enter stage left. Quite aside from the food and drink themselves, in spite of myself I discovered I suddenly had that Fall Feeling I had been craving. Perhaps the solution was never to flee the city to pick my own apples or to buy a bunch of mini-Snickers for little ghosts and goblins. 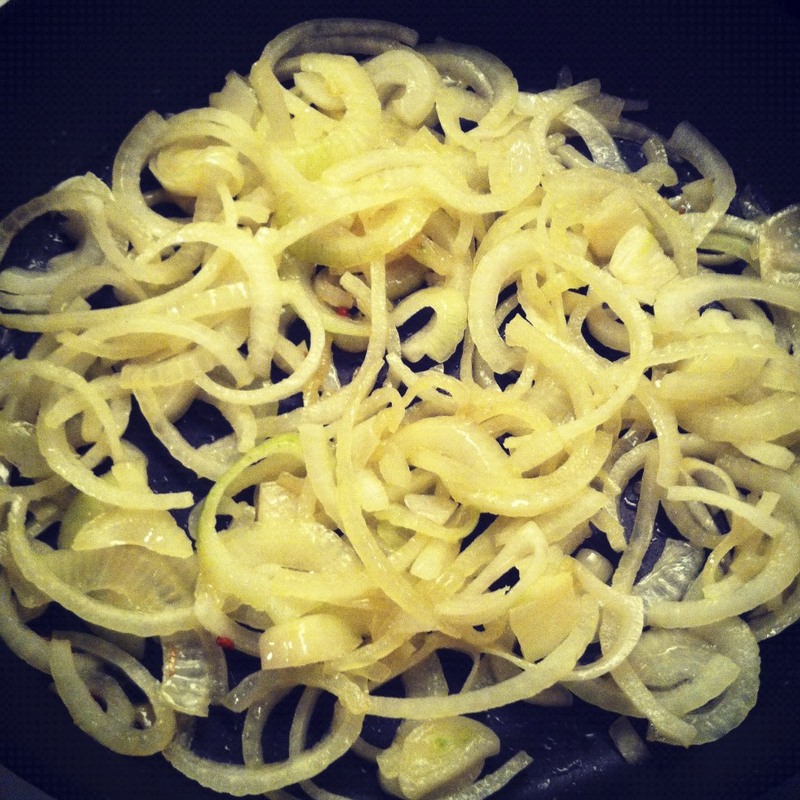 It was just to pick up a bottle of sweet ‘feather-white’, fry up some onions and let Autumn in Berlin take hold. 1. 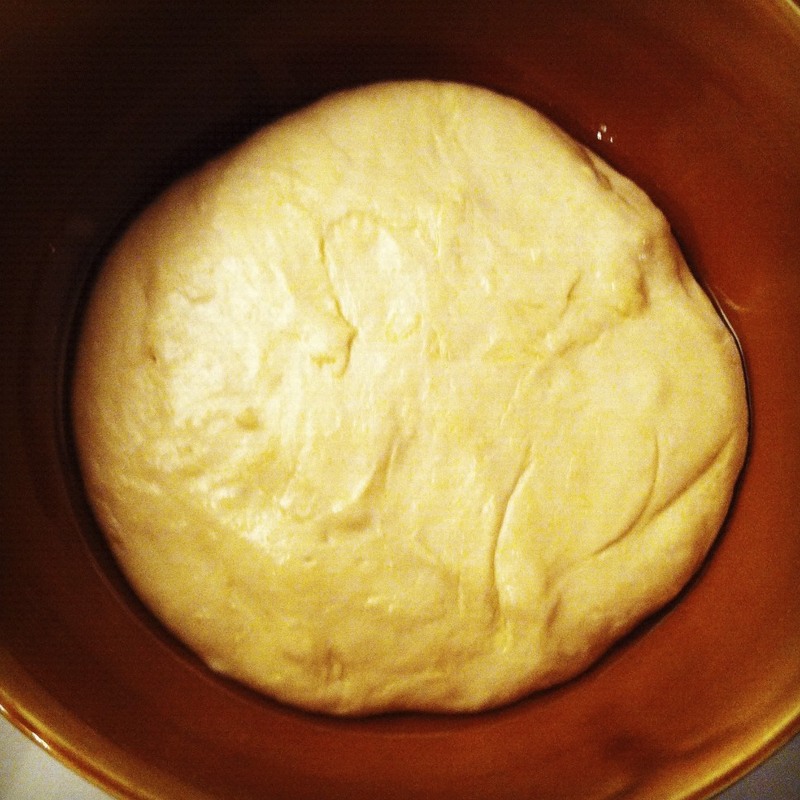 For the dough: In a mixing bowl, dissolve the yeast in the lukewarm water. Stir in 1/4 cup flour and let the mixture get bubbly, about 10 to 15 minutes. Add the kosher salt, butter or oil and remaining flour and mix to form a rough ball. Knead the dough (with hands or stand mixer) for about 5 minutes. Let rise, covered with a damp towel or plastic wrap, until doubled in size, about 1 hour. 2. To make the topping. 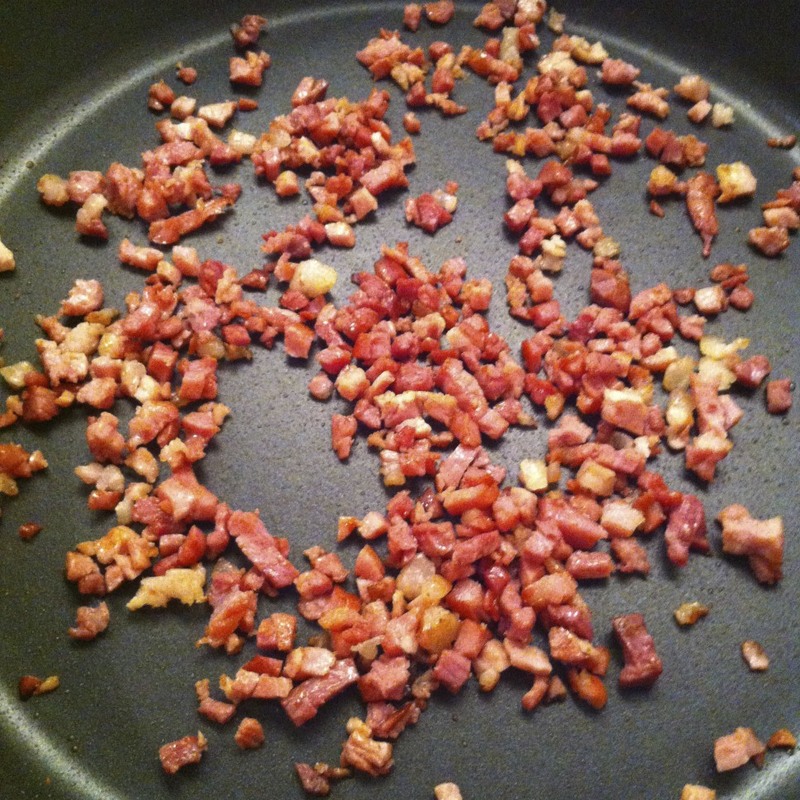 While the dough is rising, in a large skillet over medium heat cook the bacon, stirring frequently, until the fat is rendered out and the bacon is crisp around the edges, 2 to 3 minutes. Remove with a slotted spoon and drain on paper towels. Add to the skillet the olive oil and butter. When butter is melted and beginning to bubble, add the onions, sugar and ½ teaspoon of the salt. Sauté over medium heat for about 20 to 25 minutes, until the onions are completely soft and just beginning to caramelize around the edges. Remove from the heat and cool completely. 3. In a medium bowl stir together the sour cream, egg and remaining ½ teaspoon salt. Add freshly ground nutmeg and black pepper to taste. 4. Line a baking sheet with parchment paper. With floured hands, stretch and pat the dough out to cover the entire sheet. Let rest for about 15 minutes. 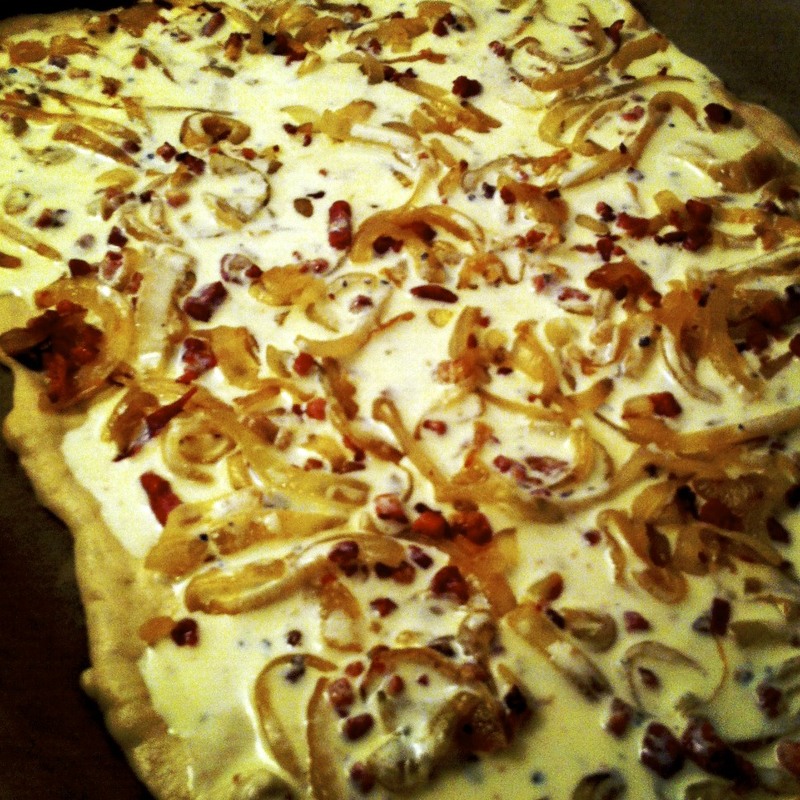 Spread the cooled onions over the dough. Sprinkle with the cooked bacon. Pour the sour cream mixture over the top and spread to distribute evenly. Let stand in a warm place while preheating the oven to 425°F (approx. 220° C). 5. When the oven is hot, carefully slide the pan onto the center rack and bake for 25 to 35 minutes, or until the topping is firm and the dough is golden. Let cool slightly, then cut into squares. Yield is only 3-4 servings, so feel free to double this recipe for a larger dinner. Enjoy with a glass of Federweisser or a crisp white wine, ideally a German one. Enjoy the cosy feeling of Fall Things.